*** This clinic does not accept self-pay patients. *** A specialist in orthopaedic sports medicine, Aravind Athiviraham, MD, cares for patients with athletic and overuse injuries, including anterior or posterior cruciate ligament tears, meniscus or cartilage injury, patellar or shoulder instability, and elbow ulnar collateral ligament tears. He is skilled in minimally invasive and arthroscopic procedures of the knee, shoulder, and elbow. In addition, he has received advanced training in complex procedures of the knee and shoulder, including revision knee ligament reconstruction, cartilage restoration, meniscal transplantation, open treatment for recurrent shoulder instability, and robotic-assisted knee reconstructive surgery. Dr. Athiviraham is dedicated to the care of his patients and stays up-to-date on the latest techniques in sports medicine. He enjoys getting to know his patients and working with them to choose the best treatment option, by fostering a combined patient-physician decision making approach. 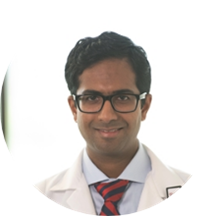 Dr. Athiviraham's current research interests include establishing a cadaveric biomechanical study for superior capsular reconstruction using human dermal allograft to optimize patient recovery from surgery and allow early return to sports activity. In order to best serve you, please remember to provide your unique member ID number on your insurance card for your appointment. If this is not provided, you may expect a call from our office to get that information prior to your appointment so we can verify your benefits. We look forward to seeing you. Dr.A gave me a lot of confidence that my knee surgery will go well and hey we can do this! Very professional and explained thing to me so I could understand. The doctor and his team were efficient, personable and professional. They answered all my questions and then some, taking the time to make sure I was comfortable in the treatment they were proposing. Great doc, great team, highly recommended!